Confederacy, (Attorney) A.W. 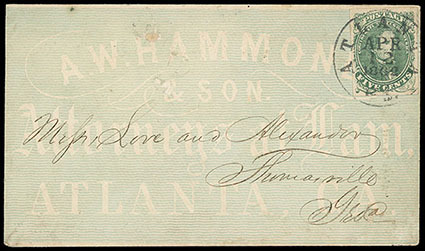 Hammond & Son, Attorneys at Law, Atlanta, Ga., greenish blue allover shaded ad on cover to Thomasville, Ga, franked with four margin 1861, 5¢ green tied by central strike of "Atlanta, Ga., Apr 12, 1862" cds; small internal cover hole, otherwise Very Fine. Scott No. 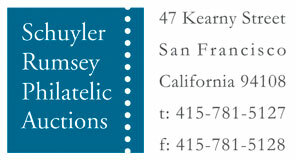 1 Estimate $250 - 350. Confederacy, (Cameo) Walker, Mead & Co., Mobile, blue oval belt cameo on back flap, on yellow cover with "Mobile Ala., Jun 9, 1861" double-circle datestamp and matching "Paid 5" framed rating handstamp to Orville Ala.; original part-printed Dissolution of Copartnership document with written letter at bottom, F.-V.F. Confederacy, (Carriage) T.D. 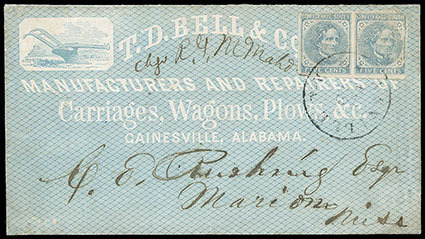 Bell & Co., Carriages, Wagons, Plows & c., Gainesville, Ala., blue illustrated allover shaded ad design showing Plow, on cover to Marion, Miss., franked with 1862, 5¢ blue, Archer & Daly printing. horizontal pair (slight scuff) tied by Gainesville, Ala. cds; cover professionally restored, Very Fine appearance, a very rare advertising design. Scott No. 7 Estimate $300 - 400. 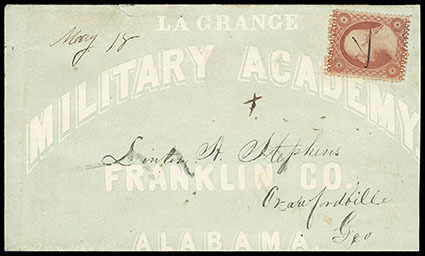 Confederacy, (Colleges) La Grange Military Academy, Franklin Co., Alabama, green allover design on cover addressed to Linton A. Stephens (brother of C.S.A. 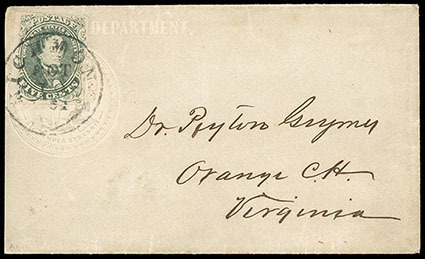 Vice-President Alexander Stephens) in Crawfordville, Ga., franked with manuscript canceled U.S. 1857, 3¢ dull red and "May 18" date alongside "La Grange" imprint; cover reduced at right, otherwise Very Fine, a very rare allover design. Scott No. U.S. 26 Estimate $400 - 600. 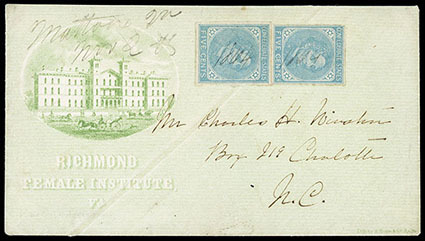 Confederacy, (Colleges) Richmond Female Institute, Va., green illustrated allover shaded ad showing College Building & Street Scene, on cover franked with 1862, 5¢ blue, vertical pair (separation crease between stamps) canceled by manuscript "1864" year date with matching "Mattoax, Va., Nov 24" postmark alongside; cover with partial backflap restored and vertical pre-printing paper fold, Very Fine. Scott No. 7 Estimate $400 - 600. Confederacy, (Government) State of Tennessee, Executive Department, Nashville, gray allover shaded state imprint design on cover to Orange C.H., Va., franked with 1861, 5¢ green over imprint and tied by "Richmond, Va., Oct 19, 1861" cds; cover slightly reduced at left not affecting design, Very Fine and choice, a very early usage of the 1861 5¢ issue. C.S.A. Catalog No. S-VA-03. Scott No. 1 Estimate $300 - 400. Confederacy, (Hotel) Atlantic Hotel, Norfolk, Va., gray allover illustrated design showing Hotel View, on cover addressed to Col. G.W. Richardson, 47th Regt. Va. 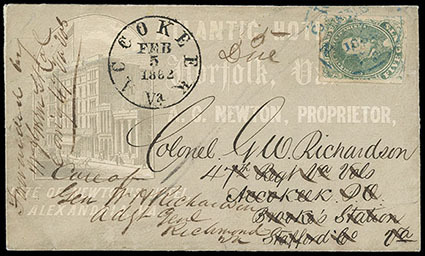 Vols., Accokeek P.O., Brook's Station, Va., franked with 1861, 5¢ green (small internal crease) tied by blue "Norfolk, Va., Feb 2, 1862" cds, forwarded to Richmond, Va. with "Accokeek, Va., Feb 5, 1862" cds and manuscript "5 Due" rating, manuscript "Forwarded by W.J. Green Lt Col Com'g 47 Va. Vols" endorsement at left, Very Fine. 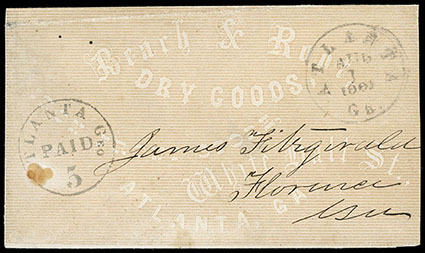 Confederacy, (Merchant) Beach & Root, Dry Goods, Atlanta, Ga., tan shaded ad cover to Florence, Ala., with Atlanta, Ga., 1861, 5¢ Black Postmaster Provisional handstamp and matching "Atlanta, Ga., Aug 1, 1861" cds; small stain spot and small piece on bottom flap missing, Very Fine. Scott No. 6XU2 Estimate $500 - 750. 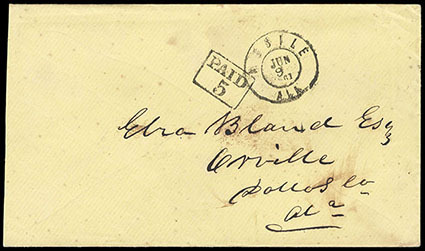 ONE OF TWO ATALANTA 5¢ BLACK POSTMASTER PROVISIONAL USAGES ON AN ALLOVER ADVERTISING COVER. 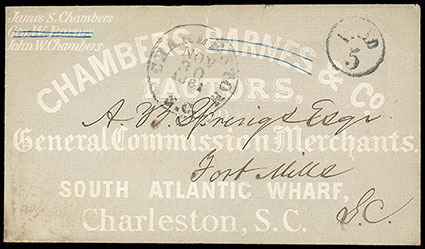 Confederacy, (Merchant) Chambers, Barnes & Co., General Commission Merchants, Charleston, S.C., gray allover shaded ad on cover to Fort Mills, S.C., "Charleston, S.C., Nov 30, 1861" cds with matching "Paid 5" rating handstamp, Barnes crossed out in blue crayon, original enclosure accompanies; small opening tear at top, Very Fine. 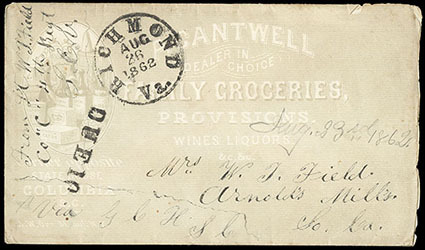 Confederacy, (Merchant) F. Cantwell, Dealer in Choice Family Groceries, tan illustrated shaded ad showing Liquor Bottles and Provisions, on cover to Arnold's Mills, S.C. with "Richmond, Va., Aug 26, 1862" cds and matching "Due 10" straight line handstamp, soldier's endorsement at left; slight edge wear, otherwise Very Fine.